I can almost not believe it myself – it’s been over 6 months since my last blog! I thought I was a little bit behind, but I didn’t realize the situation was this bad! And it’s not only my own blog I’ve neglected, but even the blogs I follow. So I spent the last few weeks reading up on my little blogging universe, and marveling at the developments in many people’s gardens over the past season. And catching up on all the news, such as the recent collision of illustrious gardeners and bloggers at Federal Twist, the incredible frequency of posts over at opensesame, and the change in continents for Intercontinental Gardener... But now that I’ve caught up, it’s time for a new post. Looking back at my last blog, it seems that I left off with my two favourite gardens in France. As luck would have it, I made a repeat visit to the second one this August, so it’s fresh in my mind. The garden is Berchigranges, in the Vosges region of north-eastern France. I came to it through Noel Kingsbury, who described it as possibly "the most beautiful garden ever" on his blog. The tour guides stand ready at the gates to Berchigranges! 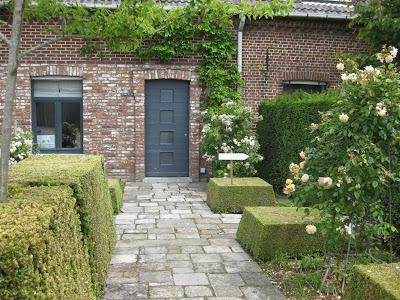 Berchigranges is a private garden, a labour of love created and maintained by husband and wife team Thierry and Monique Dronet. As soon as you step through the gate, it’s obvious that this is a very personal garden that somebody cares about, a lot. And it’s a garden that is happy being a garden. It’s not trying to make the latest design statement, or to impress visitors with anything particularly grand or novel. It is simply and unashamedly trying to create something pretty and charming. It uses flowers, lots and lots of them, and surrounds them with manicured lawns, pretty gazebos and water features. It’s not old fashioned or gaudy, it simply finds joy in growing beautiful things and combining them in beautiful ways. View across the garden in early June. 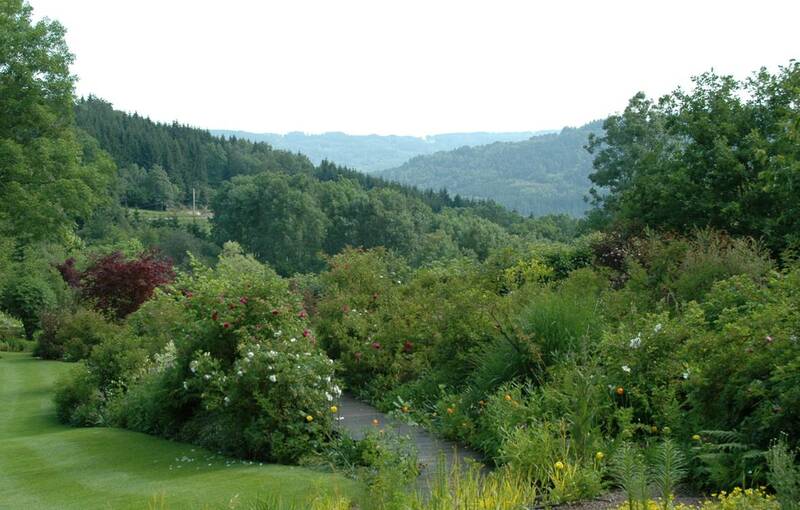 The garden is nestled on the side of a hill in the gently rolling countryside of the Vosges region, a popular tourist area characterized by its majestic deciduous forested hills. 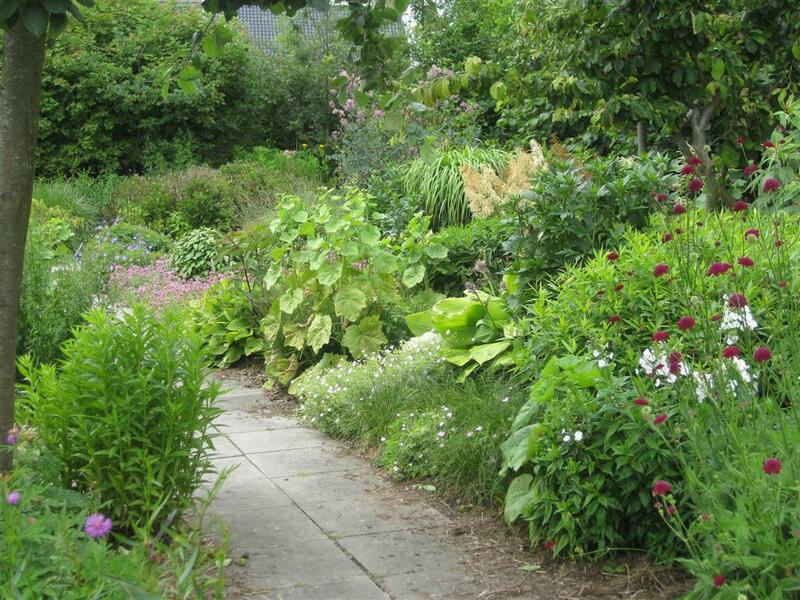 The garden covers almost 4 acres, and was built on the site of an old quarry. Over 25 years of work have gone into shaping the land into many levels, clearing and redistributing rocks, and constructing elaborate waterways. The whole garden slopes down from the main entrance, and offers open views of the majestic landscape beyond. There are many distinct areas to this garden, each taking full advantage of the lay of the land. As you walk in the gate, the first area centers around a long pond, its water dark and still. A bridge covered in grass and using short boxwood hedging as its railing is the focal point. I honestly couldn’t take my eyes off this bridge – it seemed like such a simple idea, and yet it was so powerful and managed to capture the atmosphere and elegance of the place. Jardin de Berchigranges really does focal points brilliantly. 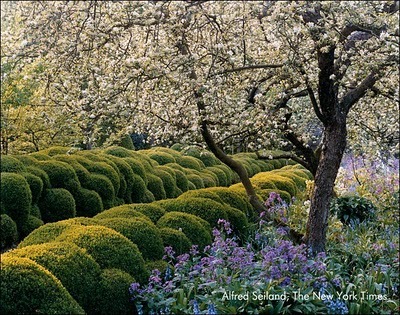 Gardeners love to place various ‘things’ in the landscape to catch the eye, and books love to tell us that we should. But at Berchigranges, this was taken to the level of art. Going on from the pond, the flower borders begin. Yes, they are irregularly shaped, with rounded edges and random curves. The owners have said that they developed the garden organically, without a master plan, and perhaps this is where it shows. But are the contents ever gorgeous! There are over 4000 plant species in this garden, and they spill out from every possible corner. While the style is abundant and loose, with lots of mixing and self-sowing evident, the gardener still appears to be very much in charge. Each composition is deliberate, and the wonderful colour and texture combinations are testament to a very sensitive eye and a lot of patience. Delighting the senses in early June. My two visits to this garden were at very different times of the year: at the very beginning of June and at the end of August. But I was amazed to note that at both times, the garden seemed to be covered in blooms. 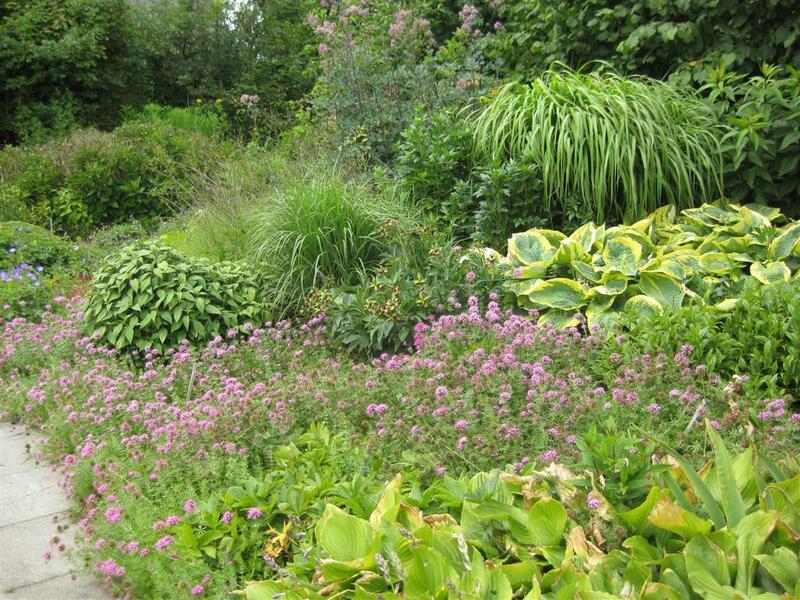 There are so many plants, and everything is so carefully tended that it manages to peak throughout the year. It reminded me of Christopher Lloyd’s approach at Great Dixter, where he advocated intense planting and management to achieve a non-stop show in his long border. But achieving this on the scale of a full garden with a limited labour force is truly extraordinary. It takes unbelievable planning and a deep knowledge of plants, how they grow and how they can share the same space. 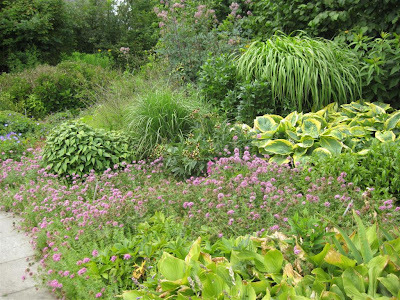 Here are a few pictures of the plant combinations I saw in June and in August at Berchigranges, to give you an idea. The same flower border at the beginning of June (top) and end of August (bottom), maintaining same colour scheme. 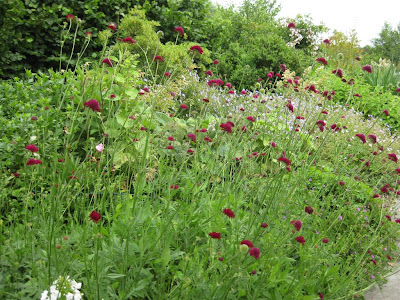 Borders overflowing with growth and colour both in June (top) and August (bottom). The formal garden putting on growth through the summer. 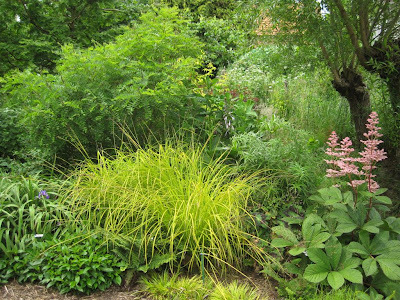 The bog garden was equally lush in August (bottom) as in June. As you walk around the grounds, the garden does fall into one little trap, which is trying to include a bit of everything. There is a a formal walled garden, a maze, an informal meadow, a rock garden, a gravel garden, pond, streams… you get the idea. As a plant lover, it's perfectly understandable that one would want to grow a bit of everything. And as a visitor, it did not upset me at all, as each part was an opportunity to showcase new and delightful things. 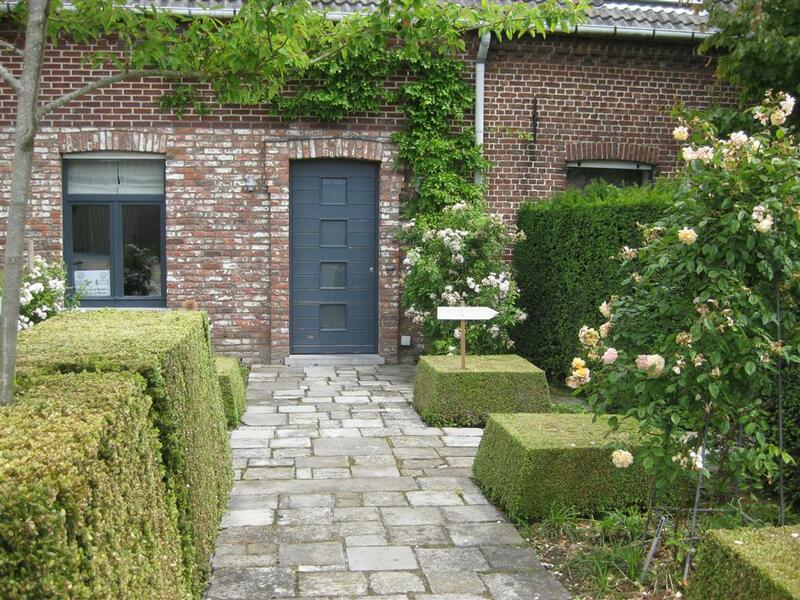 The last space of the garden is a graveled sitting area, decorated with charming wrought iron chairs and tables. I found it difficult to take a picture here without people – it was the end of the garden, and many visitors lingered here even if there were no cookies or tea. I guess none of us wanted to leave this little piece of paradise.